It’s not an easy question to answer. I usually say that it’s less densely orchestrated and less vocally difficult than a full-blown opera, and that operettas are almost always comedic whereas most (though certainly not all) operas are tragic. But that doesn’t quite get at the heart of the matter. It’s very difficult to define the lines between musical theatre, operetta, and opera, especially when opera companies occasionally mount musical theatre or operetta productions. People have proposed a number of possible criteria: Perhaps in musicals and operettas, the words matter more than the music and vice versa in operas. (This is somewhat true, but one can think of counterexamples–for instance, the primacy of the music–some of it stolen from operas–in several of Weber’s musicals.) Perhaps it is the presence or absence of dialogue. (But does that make The Magic Flute, Ariadne auf Naxos, Carmen, and other examples of Singspiel and opera comique musicals? And does it make Les Miserables and Phantom of the Opera operas?) There doesn’t seem to be a workable, clear criterion, but I will attempt to vaguely define each genre below. I’ll also discuss some “problem cases” where categorization is difficult. Musical theatre is probably the easiest of the categories to define in a semi-coherent way because of how it has evolved. The pop-rock belter vocals required by most new musicals these days are obviously not operatic and the accompanying instrumentation is far from “classical” in its sound or make-up. (Terms like “operatic” and “classical” are a bit troublesome, but I think we can agree that few people would apply them to music that sounds like contemporary pop.) It’s the older musicals that draw on the tradition of opera and employ “legit” voices that are sometimes a little confusing. Opera singers can and do successfully sing roles in musicals like West Side Story, South Pacific (in fact, the male lead was written for an operatic baritone), Showboat, Camelot, My Fair Lady, and a host of other musicals by composers like Bernstein, Hammerstein, and Loewe. However, these are still considered musicals. They demand much smaller orchestras than most operas; the roles call for widely available vocal ranges and abilities; and, perhaps most relevantly, they developed as part of a musical theatre tradition and have been termed musicals for decades. Opera involves huge orchestras and difficult-to-sing scores. Partly because of the demands and primacy of the music, it is usually sung in its original language with supertitles in the local languages (whereas musical theatre and operetta are usually sung in the local language). Although there are operas written in English, most of the most famous and frequently performed works are Italian, German, or French. A good heuristic: If a house like La Scala or the Met has performed it, you can probably call a work an opera without offending anyone. Of course, there are also operas that fall outside of that category (like Monteverdi’s operas, which don’t play well in such large houses). Most older opera is defined as much by tradition as anything else, so, by historical consensus, it’s pretty safe to refer to any sung drama by Monteverdi, Handel, Mozart, Bellini, Donizetti, Rossini, Puccini, Verdi, Wagner, Richard Strauss, and everyone else who fits into that canon of dead, white, male classical composers as an opera. When it comes to more recent compositions, what deserves to be called in opera is much less clear, especially because some celebrated musical theatre composers (e.g., Bernstein and Schwartz) have also written operas. Operetta is a convenient in-between label for things that are not quite musical theatre or opera. Gilbert and Sullivan’s works are probably the most famous examples in the UK and the States. They tend to focus on humor rather than emotionality and accordingly to use tools like comical asides and patter songs that are less common in opera. They also require smaller orchestras–most operettas sound good with 20-30-piece orchestras, which would be a severe reduction from the written score for an opera. They are less vocally demanding than operas and are often performed by amateur troops, but they still require high notes and coloratura to a degree that’s unusual for musical theatre. Like musicals, they are usually performed without supertitles, so they require clearer diction than operas and the text is set to music in a way that theoretically allows that. 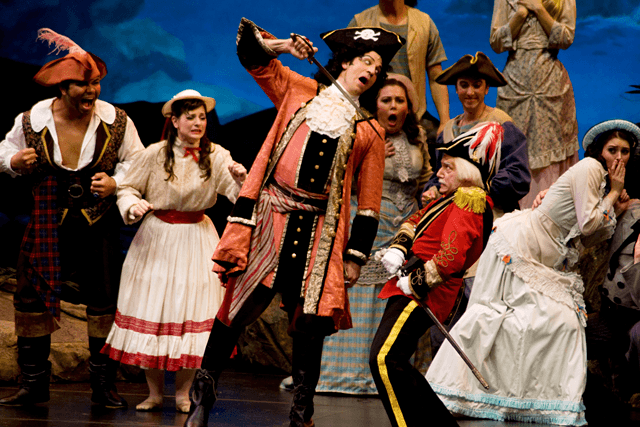 Opera companies sometimes stage operettas with casts of opera singers–for instance, Portland Opera’s 2013-2014 season includes The Pirates of Penzance. Of course, there are quite a few pieces that don’t fit nicely into any of the three categories. What is Bernstein’s Candide? Theatre companies that would never consider themselves opera groups sometimes put it on, but so do opera companies. It’s in English and much of the humor depends on the lyrics, and it also contains dialogue. But the orchestration is dense and the role of Cunegonde undoubtedly requires a classically trained coloratura soprano. Unlike much operetta, it has a respectable literary and philosophical pedigree, having been based on Voltaire’s incisive and thought-provoking satire of the same name. By tacit agreement of confused opera- and theatre-goers, it’s usually referred to as an operetta, but it doesn’t seem like it really ought to belong to the same category as Gilbert and Sullivan’s operettas. Die Fledermaus walks the line between opera and operetta. It is performed at the world’s leading opera houses (it’s part of the Met’s 2013-2014 season), which usually shun operettas. But it’s also a go-to piece for Gilbert and Sullivan societies looking to mix up their repertoire. It is frequently performed in English in English-speaking countries, but it is also frequently performed in the original German in English-speaking countries. It has gotten the Regie treatment–which operettas are usually spared–on several occasions, but when directors aren’t super-imposing dark political or psychological messages onto it, it’s about as silly and contentless as an opera/etta could possibly be. 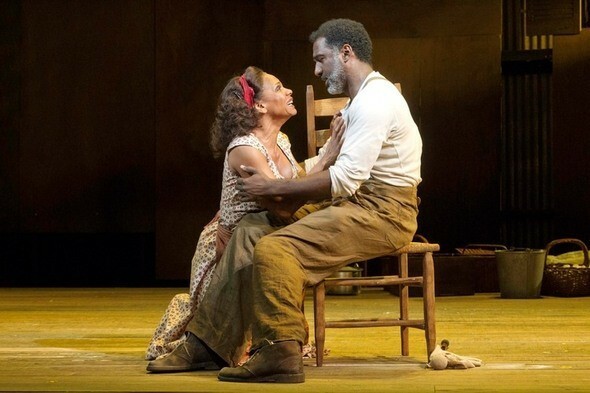 I’ll finish with America’s most controversial example of the opera-or-musical question, Gershwin’s Porgy and Bess. Gershwin conceived of it as an “American folk opera” and staged it on Broadway with classically trained singers, but opera companies would not acknowledge it as an opera and perform it until over 40 years after its 1935 premiere. This reluctance may have been partially fueled by racism–the opera calls for an all-black cast–or anti-racism–many people have criticized the opera for its stereotypical portrayal of lower-class black life–but it was also because of Gershwin’s use of jazz and folk music conventions in addition to European classical music conventions. The show eventually reached the Met in 1985… but the recent 2011 revival (which included some heavy adaptation) was on Broadway rather than in an opera house. It even won two Tony awards (“Best Revival of a Musical” and “Best Performance by a Leading Actress in a Musical”)! I apologize to any readers who were hoping for clear answers; I can’t give them to you. But feel free to use the comments to discuss what you think distinguishes musicals, operettas, and operas. I look forward to reading your thoughts.